Search Engine Optimization (SEO) is constantly evolving. It’s no longer a destination, but an ongoing journey. Gone are the days of gaming the system, and what we’re left with is good ol’ fashioned marketing, which just happens to be done online. The benefit of taking this approach (as seen by our clients) is no matter what change or update Google makes to its algorithm, your online assets will not be affected. However, once the technical stuff is taken care of, what’s left? The answer is Real Marketing & real marketing requires co-operation and participation from your team and the ability for your business to do awesome things both online & offline. The reality is you can’t fake being an awesome business – not even online. What Are Your Goals & Expectations? One of the most important things Adster can do as an ethical SEO company is to set realistic expectations with our clients. We often encounter some “old school” notions of what people expect from SEO and a challenge is getting their mindset away from “rankings”. Rankings are an outdated, and ineffective way to measure the success of an SEO campaign, as they cannot be controlled by any agency. Even though Adster Creative is Alberta’s only Featured Google Partner, we do not control the search engine or website placements (unless you’re running a Google AdWords campaign ). What we can control is driving qualified traffic and increasing the conversion rate of your website. At the end of the day, when you say you want “rankings” what you really mean is you want more traffic, leads and sales – that is something we can help with. We typically include the following graph in our proposals to give our clients a general idea of what they can expect with respects to timelines in our SEO program. It’s worth noting that depending on your industry, competition (sorry realtors and insurance folks!) and geographic reach, it can change drastically. Makes Sense, So, What does SEO in 2016 Cost? Adster doesn’t typically work on one time SEO engagements: our fee structure is broken down into an initial audit, campaign setup and an ongoing campaign (which runs between 6 – 12 months). 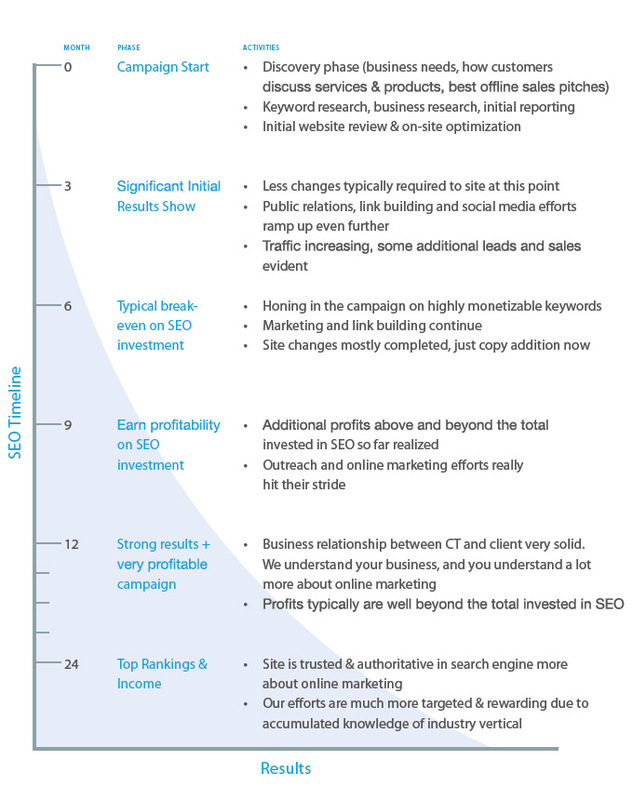 If you’d like a full breakdown of what various SEO companies across North America charge, Moz did a great survey of agency pricing structure. It’s worth noting that our pricing is competitive when comparing to other agencies of our calibre. Currently, Adster does not offer any SEO programs in this price range, however we do have a few options with respects to Google AdWords management. The reality is, SEO requires a tremendous amount of human hours as there really is no automation. If you’re running an ethical, respectable agency, there is no way that the organization is able to sustain this pricing model, and to be honest …. what company would really care about your SEO success for $300/mth? There are other companies out there willing to do SEO for you in this price range, however buyer beware – there a lot of ‘companies’ out there offering SEO services in this price range but will likely be over promising, under delivering and may even be using deceptive practices that could get your website in hot water. Adster focuses mostly on the small to medium sized business market and most of our clientele would fit somewhere in this range. If your business is service or retail based in nature, and is only targeting a single city then this budget should work fine for both organic and local SEO. It’s possible that this budget could also get you a larger campaign depending on competition and reach. The increase in budget here typically allocates for service / retail businesses that have more than one location (think Edmonton, Calgary & Red Deer vs. Calgary only) as the ongoing work may need to be duplicated, or triplicated. If your target market is regional (multi province) this also changes the strategy in how we use keywords for the company. A good way of thinking of it, is the more mainstream the product or service offering (especially for E-commerce), the more you’ll have to pay to rise above your competitors through way of authority building. For national and international campaigns there is literally no end to what can be done with respects to inbound marketing. From high value content creation (infographics, videos), seminars & educational workshops, to scholarship programs, the sky’s the limit! The same applies as above with respects to geo vs. generic (the more mainstream the product or service, the more competitive) so long term strategy is key here. It’s worth noting that from both an Adwords and SEO perspective it can be very difficult for smaller businesses to compete in this space. Think Intact vs. a small brokerage based in Edmonton. Intact is willing to pay hundreds (potentially even thousands) to on-board a new customer as they’ve spent hundreds of thousands to get their sales funnel and cross selling systems figured out to a tee.